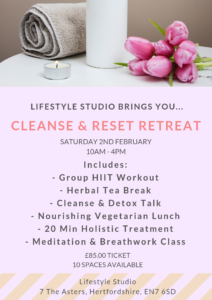 A fantastic day was had at our small bespoke Cleanse and Reset Retreat Day with 6 lovely ladies. We started off the day with a choice of a HIIT class or meditation and self healing workshop. Then we held a relaxing stretch class before herbal detox teas were served with cocoa and nut energy balls. We held an Ayurveda Nutrition workshop, giving the ladies recipes for a 3 day cleanse & detox to reset your gut health. Then a delicious vegetarian lunch was served – including tasting menu of all the detox food to sample! Reflexology and mini facials were in the healing room in the afternoon, whilst meditation and healing took place in the studio. We finished the day with afternoon tea and homemade banana and flaxseed bread. A wonderful day to relax, rejuvenate, restore and reset .